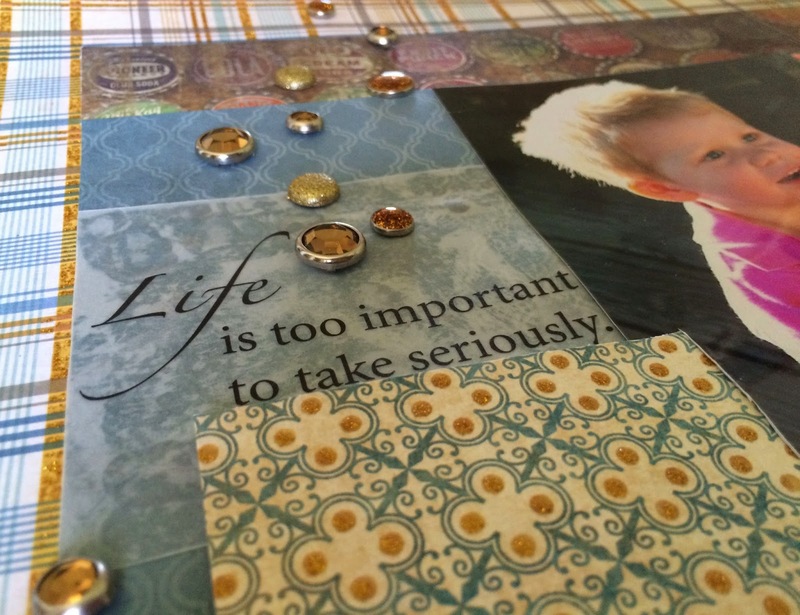 A. Gage Designs: Stick it Down: March Double Sketch Challenge! Stick it Down: March Double Sketch Challenge! I pretty much ALWAYS do double pages, aside from the first and last page of my scrapbooks, I like for there to be cohesion between pages that are next to each other. I was so excited to find the Stick it Down Double Sketches! I wanted to try something new with this layout and instead of using paper to layer the circle on top of my background paper I cut a hole in the background paper to put the circle underneath. I think it created an interesting look that I have never done before, what do you think? For this layout I chose a combination of papers, the My Mind's Eye Lost & Found 3 "Oliver" for the majority of this layout, but also included a page from the Tim Holtz idea-ology Lost and Found paper stash. I love the fun youthful feel of the bottle caps! 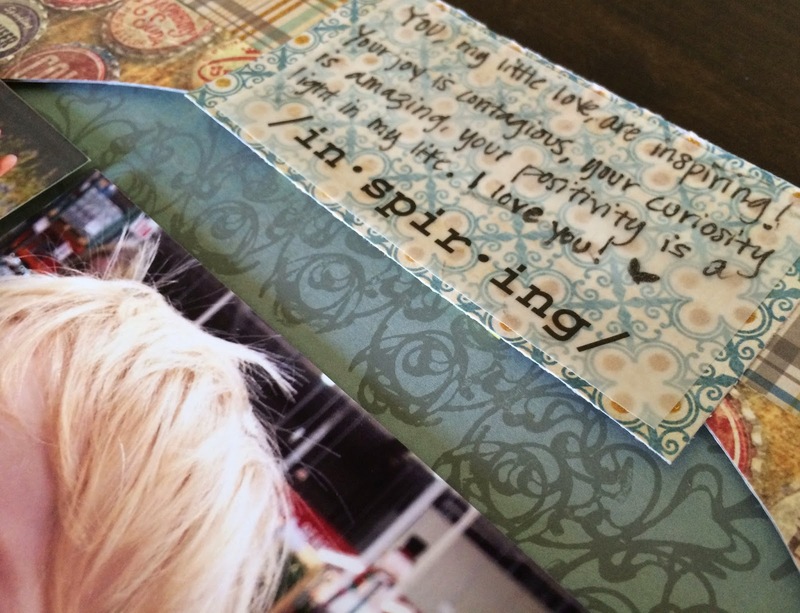 I also used vellum quotes from colorbok, my newest addiction- the inkadinkado stamping gear, and fun sparkly brads! I think this layout conveys my son's natural ability to find the fun in any activity, it captures his silliness and his love for life! I am so thankful to Stick it Down for inspiring me, everyone should check out their challenges, if double pages aren't your thing they have single challenges and card challenges too! Awesome! Have a scrap'n good time, y'all! This is adorable (the photos!) and so well done! I used to do doubles, no more! SO I Love seeing them and well coordinated they are and this sure is! Thanks for joining us at STICK IT DOWN! Thanks Marci, I love Doubles! Love your different take on the circle! Looks fabulous! A wonderful double! Thanks for sharing with us at Stick it Down! Thank you! I will definitely be doing more of these doubles challenges, so much fun! 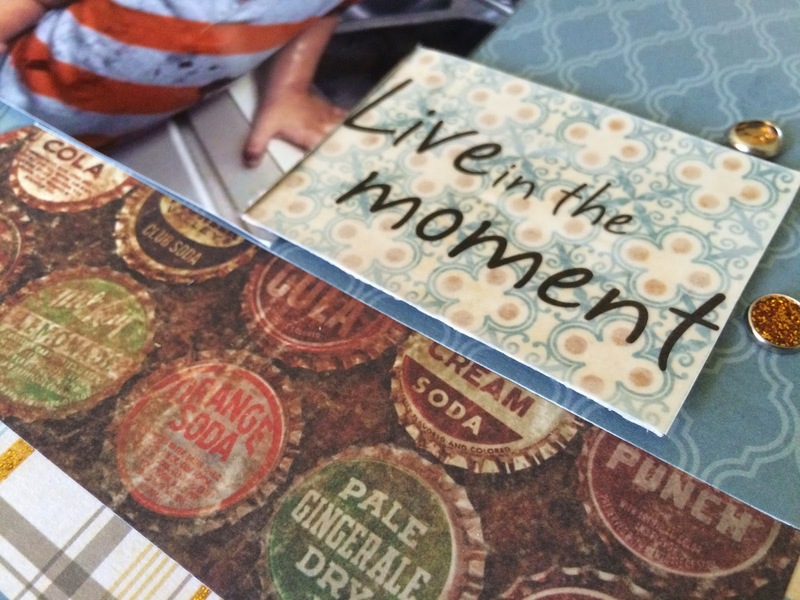 Cute photos of your son, and I love the bottle caps paper. Thanks for playing along with us at Stick It Down. Great pages! I love your paper choices and what you did with the circle. I hope you don't mind if I 'scraplift' your idea. The brads and bottle caps really add to your layout. It looks like the little one had a great time. Thanks so much for joining us at Stick it Down. Hope to see you back with us next month. Lovely! Thanks for joining us at Stick it Down! I just love the photos so adorable. Thanks for playing along with us at Stick it Down. I am loving your layout. It reminds me so much of each of my kids. Thanks so much for joining us over at Stick It Down and I hope to see more of your work in the future. Love your circle! Great double pages! Great photos! Great Gem brads! Great everything! Thank you for playing with us at Stick It Down! Great job on all aspects of the layout! Love the pictures too. Thanks for playing along with us at Stick It Down.